This master thesis purposes to provide a qualitative content analyses of “Rumiyah”, the monthly magazine published by Al Hayat Media Center, the official Media Department of the Islamic State. For this research 13 issues of the magazine will be examined from 1st publication on September 5th2016 to the 13th publication on September 9th2017. The main aim of this paper is to identify the kind of used triggers in the magazine, that can promote radicalization. In the run-up to the presentation of the analysis results, the current state of the scientific findings about radicalization research is introduced. The results of the content analysis will be compared with the results of analogous studies on the "Dabiq" magazine, before possible counter measures will be suggested and how they can be put into the practice. The main objective of the study is to understand the messages propagated through this magazine and how this knowledge can be used from governmental agencies to build up a functional counter-strategy against Islamic State’s radicalization attempts in online jihad. This master thesis is dedicated to my fallen friends, these two heroes gave their lives in the global war against terrorism in the desert of Afghanistan. These figures show that the IS also offers a huge potential of attraction and radicalization for Western socialized people. The danger arising from radicalized, violent jihadists within Europe and other Western states should not to be underestimated – no matter whether they act as single persons or as members of large structures. The IS supports comparatively simple but extremely shocking terrorist attacks through its propaganda massively.17 Like no other jihadist organization, it also stylizes individuals to heroes, who carry out small attacks against the "Western crusaders" – as idols for every jihadist fighter.18 It is noticeable, that there is not only an immediate threat of terror from the outside, but rather increasingly from the inside as well. For young Western jihadists, violence against the societies in which they grew up has become a legitimate means. - how to stop (and if necessary) respectively reverse the radicalization. What are the contents of English-language propaganda published from the Islamic State in the online magazine “Rumiyah”, which offer a radicalization potential for Western recipients? The study opens by explaining the used category system and the way how it was built up. In this context the scientific findings (theoretical framework) about radicalization processes will be briefly summed up. Further the research material is introduced before the results of the analysis work will be discussed. Then the results will be compared to findings from secondary literature about the “Dabiq” magazine. At the end of the master thesis possible counter measures are discussed and pictured how they can be put into the practice exemplified on the deradicalization center of the Bavarian police. The thesis will close by reiterating the findings of the research and the limitations of those findings, and by identifying further areas of research on the topic. In the appendix a bunch of definitions, facts about IS (history; political, social, historical and psychological logic of IS; IS’s ideological and theological inclinations; IS in number and statistics) are listed. These facts are followed by a short analysis of the development of Islamic motivated crime in Germany. At the end of the appendix, the analyses datasheets have been added. Radicalization processes are individual and different research approaches are existing. This master thesis includes not all the leading theories extensively, only the essential parts are described (which were necessary for the creation of the used category system). For a detailed overview of the leading radicalization theories, please refer to Christmann26 or Young et al.27. Additionally, next to the “Rumiyah” magazine a lot of other radicalization-books, -magazines, -websites etc. used by the IS are available. The findings referred to in point 4 are compared with an analogous study of the “Dabiqe” magazine by Kiefer et al.28 in point 5. This master thesis not includes an examination or analyzation of the distribution channels for radicalization materials used by IS. In the core of my master thesis, methodically I oriented my analysis towards the qualitative content analysis according to Mayring.29 During the analysis, I defined coding and context units, which consist of at least one subset (coding unit) – maximally several sentences (context unit). It must be noted, that a context unit is always a sense unit. So, sentences can have only one statement (meaning)30. These units will be analyzed by using a category system. Subsequently, the results were graphically processed, evaluated and discussed. The analysis work was carried out manually without the aid of an evaluation software. Now the steps of the analysis will be explained briefly: Initially I derived deductively a category system from the scientific findings of the research on radicalization (focused on identified Jihadists' motifs - especially those that attract young people). Furthermore, where necessary, I created an inductive formation of subcategories. Than the thirteen English written issues of the “Rumiyah” magazine (from September 2016 till September 2017) were evaluated using this category – system (in point 2 the built up of the category system itself is explained – the complete results of the analyses in detail are added in the appendix, point 11.4.). By carrying out a frequency analysis, the key focusses can be shown and afterwards interpreted. The method bases on an evaluation procedure that has already been applied at the Institute of Political Science at the Eberhard Karls University in Tübingen to evaluate the IS online magazine “Dabiq”31. Additionally, I described, how the layout of the different issues changed by the time based on this method (lightly modified, point 4.2.1.). The theoretical framework part and the content about possible counter measures are based on literature work. The contents have been compiled from existing scholarly publications, the internet and scientific articles. The facts and scientific knowledge were collected and discussed subsequently. A study of the radicalization discourse of IS has utmost value. Not merely from an academic purpose, it is vital to decipher and understand the radicalization tools used by IS. The narratives of IS need not only be comprehended, but also countered and replaced with alternative narratives. In our world today, it is no longer enough to defeat these Islamic terrorists on a battlefield. Much more, their fanatic narratives must be fought online with a counter narrative. Consequently, to this end academics and experts across the world have been engaged with studying and analyzing the arise, structure and spread contents produced by IS. Particularly the “Dabiq” magazine was analyzed by many different scientists. Primarily academics have been drawn towards focusing upon the process of radicalization triggered by propaganda material. There is a plethora of literature on the process of radicalization through propaganda material as well as on the IS’s propaganda efforts, ranging from major publication like: Weiss & Hassan32, Hall33, Stern & Berger34 and Lahoud et al.35 – to numerous shorter analytical texts, including those by Farwell36, Friis37, Peresin & Cervone38, Böckler & Zick39, Qadir40, Colas41 and Ingram & Reed42. Within their research, Weiss and Hassan, present the rise and expansion of the IS. Dozens of interviews with experts from the US military, various intelligence agents and former IS fighters focused intensely on how an almost defeated insurgent group could become a serious army of fanatical jihadists. Hall first handed information by conducting narrative interviews directly with IS militants in Syria. In doing so, he not only presents the personal curricula vitae of individual fighters, but also explains why the Levant region will suffer for a long time from the long-term effects of IS's occupation. In their work, Stern and Berger analyzed the new model of violent extremism that IS wants to incorporate into its own proclaimed caliphate in Iraq and Syria and implement it around the world. The analytical work traces the ideological innovations of the IS as well as the path of recruitment processes. The use of shocking pictures in this context is also discussed. The report of Lahoud et al. identifies key areas where IS has demonstrated strength, learning and adaptive capacity. In contrast, weaknesses, flaws, and deficiencies in the field of ideology are also identified. To this end, the history of IS is drawn and compared with other prominent militant organizations (Al Qaeda and Taliban). Farwell's work focuses on how IS uses brutal violence to establish its legitimacy. Here, the use of social media and cyber technology as a means of transport is discussed. The effect of IS produced splatter videos (showing beheadings) on the population in the United Kingdom and in the United States examined Friis. She illustrates the impact of the power of these images on American and British security discourse, too. In their research Peresin and Cervone examined the role of women in the state construct of IS; distinguishes between the non-combat roles and the militant roles of women in this context. It also draws a situation picture of women who want to leave Europe (whose aim is to live in IS) and what problems can arise with female returnees. Which specific motives for young Muslims in Germany are the reason why they are attracted to jihadism was examined by Böckler and Zick. Excessive demands in everyday life, the offered sense of community and the explanation of the world with simple truths are determined as the main factors here. In that regard, particularly noteworthy are the anonymous case studies of Qadir. He demonstrates the numerous push-and-pull factors act on young people and detail the practical methods and solutions involved with changing permanently attitudes and behaviors. Colas analyzed the "Dabiq" magazine in terms of targeted audiences and fundamentalist content. He explains the hermeneutics of IS in its media efforts to fathom the logic behind the messages. Ingram and Reed explored the role of instructional material of the “Inspire” and “Rumiyah” magazine. In their work, the communication content of this propaganda magazines was analyzed and examined in more detail. As a result, strategic communication recommendations are proposed for possible proactively undermining extremist messaging as well as post-incident responding. Because IS's global threat, research into all scientific disciplines in this context is being driven by the whole Western world. In my opinion, leaders in this field are the King's College London's "International Center for the Study of Radicalization and Political Violence", the West Point Military Academy's "Counter Terrorism Center" and the University of Leiden's "Terrorism and Political Violence Research Program". Regardless of these well credited academic ventures, there’s still a gap in literature. Upon reviewing literature, an extreme dearth of available academic paperwork about the "Rumiyah" magazine, IS latest publication, can be seen. All the texts mentioned focus upon either “Dabiq” or other publications by terrorist organizations such as “Inspire” magazine by Al-Quaeda. The absence of literature on “Rumiyah” is troubling and demanding, however comprehensible – given to the timeline of “Rumiyah’s” publication, they have been recently published and in fact are still being published. 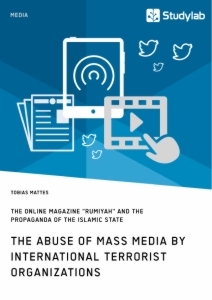 Apart from the scarcity of literature on “Rumiyah”, all the above-mentioned texts point towards the professional production graphic violence and proficient utilization of social media to account for the appeal and success of the IS productions. This research study deviates from these trends in the current literature at two fronts: first by focusing upon the magazine “Rumiyah” and second by focusing upon the triggers which succeeds to alter the recipient’s perception and can start the radicalization process (radicalizes them to fight for IS’s goals). By the rounding off comparison to the study of Kiefer et al. (point 5. ), in which with a comparable category system the "Dabiq" magazine was evaluated, similarities of these two online magazines can be shown, but also their differences. The aim should be to present any identifiable changes in the radicalization triggers used by IS in its publications (which may be related to the substantial changes in IS territory). These results should help research and practice on prevention, intervention and deradicalization, and should allow governmental agencies to effectively tailor their strategies to the specific triggers of IS radicalization attempts. As mentioned several times above, I believe that the phase of cognitive opening plays a special role - but I also recognize that propaganda is likely to influence the recipient at a later stage of radicalization. This means that propaganda not only recruits sympathizers (for example by confirmation), it consolidates and continues additional the radicalization process later. However, the results of this work cannot say anything about whether and what effect individual propaganda motifs have at which point in the radicalization process of individuals (these would be objectives of psychological researches on recipients). Rather, the results presented here show which motifs are taken up by the transmitter in its communication, which can potentially have a radicalizing effect. In this thesis, I associate social-psychological radicalization research with a propaganda analysis and examine whether and to what extent the already known motifs (identified by the radicalization research) are contained in the propaganda of IS and how they are structured in content. As explained in the previous part of the theoretical framework, I have based on the results of radicalization research for establishing my category system. It is grouped into the three main categories “Deprivation”, “Social Relations and Affiliation”, and “Orientation and Meaningfulness”. During the analysis, I defined coding and context units, which consist of at least one subset (coding unit) – maximally several sentences (context unit). It must be noted, that a context unit is always a sense unit. So, sentences can have only one statement (meaning).73 In passages in which statements are substantiated by longer tracts, I have encoded the statement only once. I have doubly coded and strictly divided the two categories of “concept of the enemy” and “deprivation” because of their proximity to content. Furthermore, it must be noted that it was difficult in some cases to divide the categories "concept of the enemy - wrong religion" and “delimitation to the majority" (in context of the Muslim world outside the IS). By the way, each issue of “Rumiyah” forms one analysis unit. “Adventure and borderline experience”: In this category should be encoded the advertisement for involvement in the IS's struggle, which is presented as an individual adventure and challenge. This should be done by exemplifying the allegedly exciting and adventurous experiences of IS fighters. This category has been included in the analysis for comparability with the analysis work about the “Dabiq” magazine from the secondary literature. In my analysis, no sense units could be identified that would have been subsumed under this purely (if then this category was marginalized, but the main context was different). 5 There are many different names for the so called Islamic State (IS) – e.g. ISIS – Islamic State of Iraq and Syria, ISIL – Islamic State of Iraq and the Levante or DAESH – (acronym of Arabic name) ad-daula al islāmiyya fī l-‘Irāq wa-š-Šām. In this scientific work, I will use IS in order to simplify the reading flow. I waive the addition “so called”, without wanting to give the IS legitimacy. 11 Abu Bakr al-Bagdadi was born on July 28th in 1971 / Iraq. He claimed to be the next righteous caliph and he announced the establishment of a worldwide caliphate on June 29th in 2014 – the hour of birth of the Islamic State. According to the Russian government al-Bagdadi had been killed during an airstrike in Mai 2017. 53 About 25% of the German population suffers from diagnosed depression or anxiety disorders, so more than one million people receive inpatient treatment every year (https://de.statista.com/themen/1318/psychische-erkrankungen/). Communication via mass media by international terrorist organizations. A completely new phenomenon? Ecommerce Operations. Critical Analysis of the Online Music Magazine "Resident Advisor"